An objective method has been developed for measuring the stray light in optical systems. Stray light reduces the contrast of image and falsely appears to augment the light transmission of optical system. The method utilizes a photoelectric apparatus to compare the contrast of an image formed by an optical system with the contrast of the object under examination. This comparison, when expressed on a percentage basis, is referred to as “the contrast rendition” of the optical system. The contrast rendition of telescopic, photographic, and microscopic systems has been studied under a variety of conditions. It has been found that the contrast rendition values range from 3 to 100 percent for the systems studied. The contrast rendition of an optical system has been found to depend upon its optical and mechanical design, the use of reflection reducing films, surface defects, the cleanliness of its optical surfaces, the use of lens shades, and the brightness condition of the region surrounding the object under examination. The contrast rendition, for large targets and for a uniform surround, has been found to be independent of the brightness level at which the measurements are made, the contrast of the object, the field angle, and the optical aberrations present in the systems examined. The importance of contrast rendition in telescopic systems has been evaluated using the methods and data of Hardy, Duntley, and Blackwell. 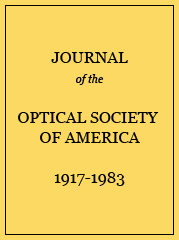 This evaluation was made by comparing the computed loss in range that would be caused by an imperfection in contrast rendition with the loss caused by an equal imperfection in light transmission and in magnification for telescopic systems. It was found, for all brightness levels, that the contrast rendition was generally more important than the other two variables. Because of the indicated strong dependence of the range at which targets are visible upon contrast rendition, ranges were computed for specific objects, instruments, and observation conditions, and compared with the results of an extensive visibility field test conducted from aboard ship. The computed and observed ranges were found to be in close agreement. This indicates that the contrast rendition of an optical system is a major factor in determining its performance. The contrast rendition of coated telescopic systems of different design. Contrast rendition of coated and non-coated 7×50×7° binoculars. The contrast rendition of 7×50×7° telescopic systems for targets of different inherent contrast. The contrast rendition of a 7×50×7° telescopic system for targets of different subtense. The contrast rendition of coated telescopic systems for various angular subtenses of a uniformly illuminated surround. The contrast rendition of coated telescopic systems at different brightness levels of a uniform surround. The contrast rendition of 7×50×7° telescopic systems at different ratios of the brightness of the wide to small angle surround. The contrast rendition for a non-coated 7×50×7° telescopic system at different field angles with respect to the optical axis. The contrast rendition of 7×50×7° coated telescopic systems for different stops in the exit pupil plane. Contrast rendition vs. ratio of brightness of wide to small angle surround for a non-coated 7×50×7.1° telescopic system with and without scratches on the front surface of the objective. The contrast renditions of photographic objectives of different designs at full aperture. The contrast rendition of process objectives at f: 64 for targets of different inherent contrast. The contrast rendition of photographic objectives at different ratios of the brightness of the wide to small angle surround. The contrast rendition of 210-mm Tessar at f:4.5 for different field angles. The contrast rendition of photographic objectives at different f:numbers. The contrast rendition of a 300 mm f:4.5 non-coated Tessar with and without a light thumb print on the center of its front surface. The contrast rendition of a non-coated 100 mm f:2.3 Baltar for lens shades of different angular subtense. The contrast rendition of coated telescopic objectives of different designs. The contrast rendition of 7×50×7.1° telescopic objectives of the same design. The contrast rendition of coated and non-coated 5×35×13° telescopic objectives having six air-glass surfaces. The contrast rendition of 7×50×7.1° binocular objectives of various field angles. The contrast rendition for various ratios of brightness of the wide to small angle surround for 5×35×13° telescopic objectives having six air-glass surfaces. The contrast rendition of microscopes of different design. Contrast rendition of monocular microscopes of the same design. The contrast of a monocular microscope for six different 32-mm objectives of the same design. The contrast rendition of the left barrel of a binocular microscope for targets of different inherent contrasts. The contrast rendition of the left barrel of a binocular microscope for reflection and transmission targets. The contrast rendition of the left barrel of a binocular microscope for uniformly illuminated surrounds of different sizes. The contrast rendition of the left barrel of a binocular microscope for different field positions. The contrast rendition of the left barrel of a binocular microscope for different condenser stops. The contrast rendition of the left barrel of a binocular microscope for a light thumb print covering 1 3 of the front surface of each objective. The contrast rendition of coated eyepieces of different design. The contrast rendition 7.1×7×65° eyepieces of the same design. The contrast rendition of non-coated and coated 7×50×7.1° binocular eyepieces. The contrast rendition of a 7.1×7×65° eyepiece for targets of different inherent contrast. The contrast rendition of a 7.1×7×65° eyepiece at different field angles. The contrast rendition of a 7.1×7×65° eyepiece for stops of different diameters placed in the plane of the exit pupil. The contrast rendition of a 7.1×7×65° eyepiece with and without clean optics.